In the art of warfare, the cornerstone of success for every winning organization has been its ability to effectively move men and supplies. These operations known as 'Supply Trains', involve a complex matrix of mutually consenting operations which define the doctrine of "Air, Sea and Land Battle." Equally important to the land mobile force, is a asset base to provide reconnaissance and combat intelligence. The effective means of determining opposition force structure, terrain variance, along with other movement assessments is critical in the defeat of any opposition force. For over 4000 years the horse provided the base element of maneuver elements and fast reaction units of every army of the world. Periodic changes in every aspect of this fantastic animal were used in the development of the military's doctrine of engagement. Bred to carry heavy loads, increased endurance, and of course discipline (at least equivalent to those troopers with whom they served,) the horse was rained supreme. As steam power and the industrial revolution swept away the constraints for the captains of industry, so was engagement concepts of major military forces. The armies of the world also desired to be 'one-up' on their perceived adversaries in techniques of route control and the machinery of warfare. The revolution into motorized transport of men and materials was no overnight accomplishment. The demands of mechanization, and the human inertia to accomplish the task, was staged process as was the development of what was to become what is perhaps the most recognized profile of a true legend. 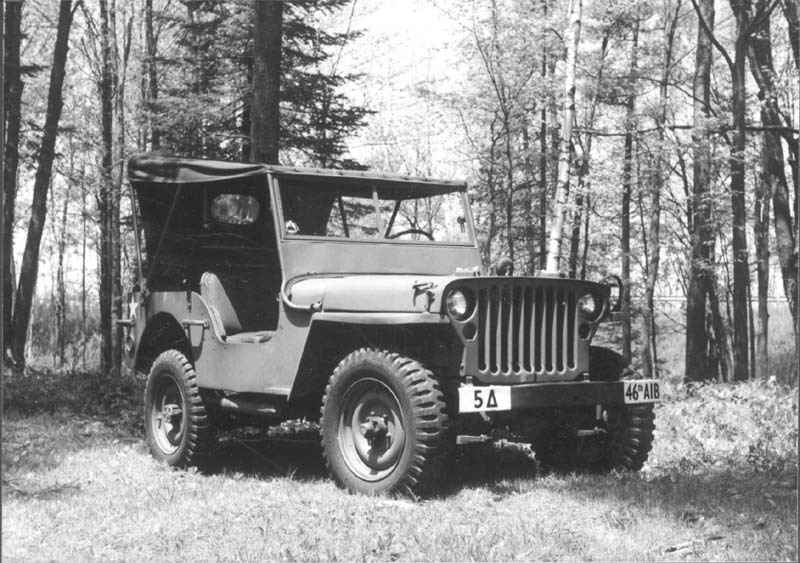 The W.W.II Jeep clearly became the silhouette of victory for allied military forces. The search to develop a machine which was all weather, and equally at home off road as the horse, came slow. The space between the wars was filled with suggestions of suitable vehicles to fill the evolving necessity and role of what would become the Jeep. Until August of 1942, vehicle development within the United States military was split between the Ordnance Department and the Quartermaster Corps (QMC). The QMC had the responsibility for 'general purpose vehicles', and the Ordnance Department for combat machines. This naturally enough did little to assist in concept development as ideas are often seen as career competition. After the First World War the Ordnance Department suggested the development of a reconnaissance vehicle capable of negotiating difficult terrain. Naturally enough the QMC also illustrated a combat need for a similar vehicle and thus the foundation was laid for development of the jeep. However, the main obstacle to be breached was mere money, as the military was not exactly well-funded at that point in time. Experimentation of both requiring departments were conducted with principal examination given to existing production vehicles, construction equipment and trucks of the day. Examples of these were the Dodge Truck, the Marmom-Herrington ton, 4x4, and converted International trucks (D2), and a Ford truck (LD1). No taller then 36 inches. Between 750 and 1,000 pounds in weight. Demonstrated off road cross country ability. Capable of mounting a detachable .30 machinegun and carry 3,000 rounds of ammunition for it. 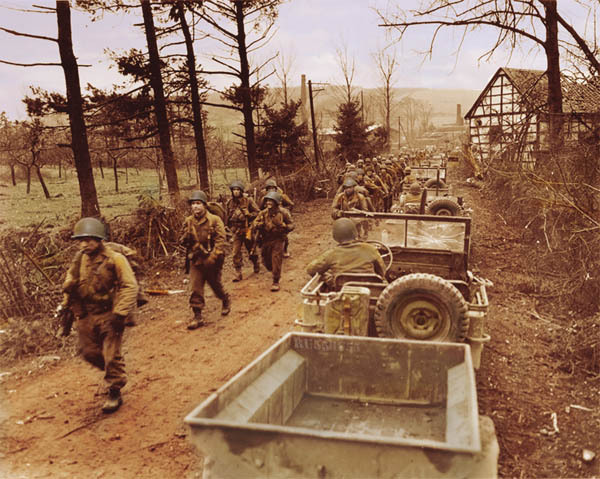 Substantial accomplishments in the Jeep development came from within the United States military. Captain Robert G Lowe, and Sergeant Melvin C. Wiley, were on the leading edge of development of a cross-country military vehicle. Captain Howie had been developing the concept and application of a military vehicle from as early as 1934. His development and research had progressed to the extent that in 1937 actual plans existed for a vehicle meeting the basic identifiers of the Chief of Infantry. So significant was the idea in the minds of military leaders that General Walter Short, Commandant of the Infantry School, Fort Benning, Georgia, appropriated $500.00 in Company Funds (suggested as having come the Book Store) for a prototype to be constructed. The vehicle developed would become known as the 'Belly Flopper' owing its name to the configuration of the operator and gunner. The preferred name of its daddy, Capt. Howie, was the 'Howie Carrier'. Essentially, the vehicle was a platform with a four-cylinder engine mounted in the rear using a front driven axle assembly. An interesting point in the 'fabrication' of the test vehicle was several key components were salvaged 'Austin American' parts found in the Fort Benning junkyard. In reality the parts were residue of a test vehicle shown to the Army. As we will see, the Austin Company will play a critical role in jeep development in the immediate future. In 1937 the vehicle was demonstrated to the Infantry Board for evaluation and recommendation. The board took exception to the ground clearance but acknowledged it as an advance in concept development. So enamored with the vehicle was General Short that in March 1940, he persuaded representatives of the Willys-Overland Motor's to observe the vehicle. The chief engineer and president examined the vehicle, with muted enthusiasm. They showed interest in its accomplishments as at the point in time of their examination it had clocked over 4000 miles of use. However, their enthusiasm was far less and acceptance of the design. This decision was of course in no way incident to the fact that Willys-Overland had submitted a test vehicle to the Army in 1938. The (American) Bantam Car Company, Butler Pennsylvania, (AKA Austin American until the middle 30's) in 1938 loaned several roadsters to the Pennsylvania National Guard. Finding the vehicle very suitable for multiple roles, they submitted a test report of their evaluation. In May 1940 the military sales representative of Bantam solicited the Army for purchase of an improved roadster. In June, 1940, board members of infantry and Calvary were sent to the Bantam factory. Joining this party was none other than now Major Howie, joined the evaluation team. Major Howie represents his linking up with the evaluation team in an interesting fashion. "In June 1940, while I was on maneuvers with the Provisional tank Brigade in Louisiana, I received a radiogram from the Chief of Infantry directing me to proceed to Butler Pennsylvania, to the Bantam Motor Car Company and to bring with me the drawings of the "Howie Carrier." Upon arrival at Butler, I met an Infantry, Ordnance and Quartermaster Committee, who informed me that 70 vehicles were to be contracted for and that I was to turn over my drawings and remain with the Bantam company to formulate plans and specifications for the new vehicle. The Board also asked me to form an opinion as to whether or not the Bantam Company was capable of building the vehicle if awarded the contract. In July, 1940, invitation s to bid on seventy "light reconnaissance and command cars or trucks" was issued to 135 manufacturers. Included in this offering was Willys-Overland and Bantam. As a note, the bid was not to exceed $175,000 for the total contract. On July 22, 1940 the two bids received were opened. They had come from Willys and Bantam. A controversy was certain enough from only two bidders but is pale in comparison with the partisanship that would develop as the Jeep story goes on. As one might suspect all the elements of an American drama were either present, developing, or in the minds of the power brokers of the day. The Bantam Company ultimately was awarded the contract and had to work around the clock to meet the bid specification and submission date. It seems that there were less than twenty people on the Bantam payroll and no engineering department existed. Not exactly the picture one would expect of such a key player in the development of what would become a world class vehicle. In 1936 the American Austin Car Company, changed leadership and its company name. The new name was the American Bantam Car Company and the new president was Francis Fenn. In 1940 Fenn was to contact the gifted engineer and former partner in the American Austin Car Company, Karl Probst and asked he return to the company and lead the development team of the new reconnaissance vehicle. He did, and the vehicle that would become the Jeep began to take shape. On September 22, 1940, the first Bantam vehicle arrived at the military test site. An interesting note was the vehicle arrived a mere 30 minutes before the deadline of timely delivery. Had they not made the mark the Bantam Company would have been assessed a late charge of $100 per day. It would be interesting to calculate in today's dollars what such a late charge would be. The American Bantam Company was by far the smallest of the three companies, which would ultimately produce a jeep. The Ford Motor Company was by far the largest with over 100,00 workers, Bantam had about 450 and Willys was approximately midway between both. Ford and Willys both appreciated the profit to be had in any large military contract. One additional manufacturing concern to bid on jeep production was the Checker Cab Company who actually produced an engineering prototype. To this end, then, as now, intelligence on the competitors was essential. It was alleged in a later hearing on the awarding of contracts surrounding the jeep, that Ford had engineers examine the Bantam test vehicle while undergoing military evaluation. This was suspected as at the minimum having passive Army approval. The representations of said respondents (Willys) ... have the capacity and tendency of deceiving and misleading the purchasing public into the erroneous belief that such representations are true, and there by the purchasing public is induced and will be induced to purchase the automotive products of respondents Willys-Overland Motors, Inc., in preference to and instead of those of other manufacturers of and dealers in like products. While Ford and Willys produced a standardized vehicle in which may components would interchange there were certain small differences that distinguish the items apart. One main component of this separation is Fords image driven obsession with identification. Almost every part produced for Ford had an "F" stamped into it. This marking of their territory extended into such items as gears and small parts not visible after assembly. The jeep story is laced with government hearings of proprietary interests, selective levels of special interests and suggestions of down right theft. In the after war times, the issue of 'who was the founder of the jeep', would go to court to be settled. In all that took place, the outcome was a success for the Allied cause and development of a life long love of a vehicle for countless people.